How did we go from Fair Hill to the end of November? I have a lot of catching up to do. Selena and Solo at the Fair Hill International Three Day Event. First of all, Fair Hill itself. It wasn’t our best ever three day. Solo retired on course after getting het up (excited) and not staying straight enough for a skinny. He is definitely struggling a little more at the three star level than he ever did at the Advanced. There is a point in the three star dressage test where he swaps his leads every time. The sad thing is that his dressage really is getting better and the problems can really only be described as mistakes rather than pure tension. We give him Omega Alpha’s Chill Ultra an hour before his dressage test and it seems to make a difference. Although he is still not consistent or steady, he IS doing a dressage test and is no longer last on dressage day. 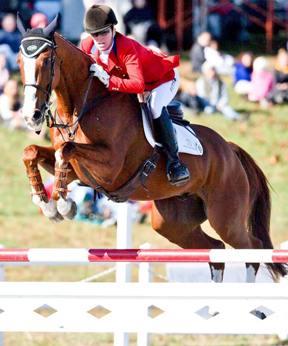 Selena and Rocky take on stadium jumping at Fair Hill. Rocky was wonderful, he was very excited. Although he is nearly fifteen years old, he has not had a lot of Advanced and three star experience. He was quite tense throughout the whole outing. His tension showed in his dressage test, which was a shame as he warmed up the best he has ever gone. 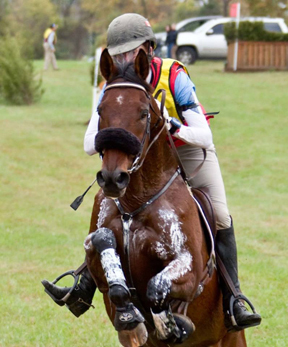 He did a lovely clear cross country, but Selena did not press him for the time, again, because she could still feel the tension and excitement in him. She and Rocky took ten time penalties on XC and one rail in show jumping, which left them in fourteenth. Not quite what we had hoped for but a very solid showing. The next big CCI for Rocky will be Rolex where he and Woody are both scheduled to run in their first four star. Solo sadly is not qualified, he has not had a qualifying score at a CCI, perhaps that is a blessing in disguise, riding two horses at Rolex is enough for anyone! Because I am so far behind, I am going to split my ‘catch up’ into two or three posts, so as not to bore you for hours. There have been no more team training sessions in Canada. In fact, there have been very few Canadian team training sessions this year. Coach Clayton Fredericks was on hand at Fair Hill and Selena really felt that her sessions with him are very worthwhile. I went to The Horse of The Year Show in Birmingham, England. In fact, Selena left for Fair Hill the day I got back. It was a lot of fun in England to see all the native breeds. We do not have the depth of native pony breed in NA that they have in the UK. The show pony classes are very different from here and the ponies have to line up and stand quietly for an hour or more in the main ring. If they fidget, they lose overall marks from the judge who appears to have eyes in the back of his/her head. The adult riding horses, hunters and hacks are all ridden in the ring by the judge. The classes can sometimes take up to two hours at a big qualifier like Windsor Horse Show. 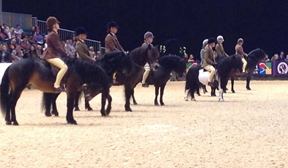 HOYS (Horse of the Year Show) is the show pony/horse championships for all show classes at the end of the year.